This high performance KVM extender enables you to locate your critical computing hardware in a secure and temperature controlled environment away from the user workstation whilst maintaining the original user desktop experience. 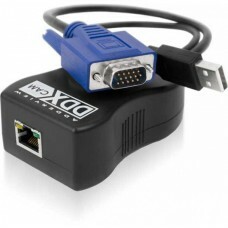 Every pixel uncompressed video technology with ultra-low latency Unlike many other digital KVM solutions, the DDX delivers every pixel of every video frame to ensure perfect digital video all the time. Resolutions up to 1920 x 1200 at 60Hz are supported, including 1080p. Uncompressed video technology ensures ultra-low latency and a perfect “at-the-computer” experience. Start with one, graduate to many The DDX-CAM and DDX-USR modules provide an easy solution to extending a single computer and its peripherals. However, when you introduce a DDX switch between them, suddenly you have the basis of an expandable switching matrix. Just add further DDX-CAM and DDX-USR modules for each new computer system and user. This superb flexibility safeguards your investment and provides a pain-free progression path. Please see the DDX30 datasheet for further details. USB 2.0 Enables connection of any USB human interface device (HID) from mice and keyboards through to touch screens. Simple CATx cabling DDX uses widely available CAT6 cable to connect the user console (up to 50m) and computer dongles (up to 10m) to the central switch. “Zero U” Computer Access Module The compact DDX-CAM computer module derives all its power from a single USB connection and takes “Zero U” space in your rack. Available in DVI and DisplayPort versions to match your computer. EDID management The extender has an intelligent EDID management to allow the true characteristics of the monitor to be passed back to the computer. Plug and Play The AdderLink DDX-USR extender is delivered in a zero config state so you can plug the units in and start working with them straight away. There is no need for drivers or software to be installed. USB audio composite device CD audio quality (stereo channel 16 bit sampled at 48kHz) is available to transfer audio from transmitter to receiver for line out and headphones with microphone input available.